Engineers at the University of California, Berkeley, have shown that it is possible to reduce the minimum voltage necessary to store charge in a capacitor, an achievement that could reduce the power draw and heat generation of today’s electronics. 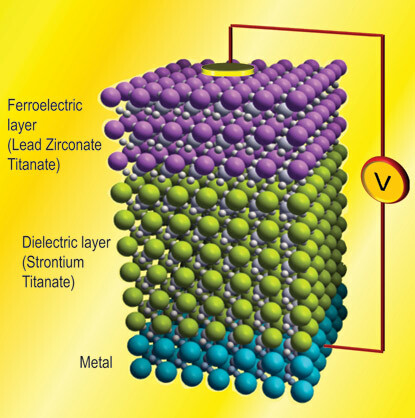 The solution proposed by Salahuddin and his team is to modify current transistors so that they incorporate ferroelectric materials in their design, a change that could potentially generate a larger charge from a smaller voltage. This would allow engineers to make a transistor that dissipates less heat, and the shrinking of this key computer component could continue. Until then, Salahuddin noted that there are other potential applications for ferroelectrics in electronics. “This is a good system for dynamic random access memories, energy storage devices, super-capacitors that charge electric cars, and power capacitors for use in radio frequency communications,” he said. This research was supported by the Semiconductor Research Corporation’s Focus Center Research Program and the Office of Naval Research.